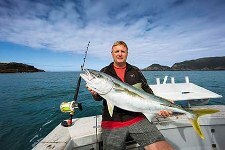 Trade-a-Boat tests some of the best trailerable fishing boats in New Zealand, including the White Pointer 940 Pro Sportsman. Don’t tell my wife but I’ve recently found my ultimate ‘Girlfriend!’ She’s a gorgeous piece of eye candy with curves in all the right places and a vivacious attitude that rocks my socks off. She’s the new White Pointer 940 Pro Sportsman driven by the power of a Volvo Penta D6-400, and true to her toothy namesake she’s as tough as steel with an awesome bite. White Pointer’s trademark is the variable geometry in the "rounded compound curve" hull. They say it forces water out for a softer, smoother ride and, I can tell you, it works. This obviously coincides with a premium manufacturing method where the 6mm hull is actually formed to the internal structure shape instead of vice versa. The sides are 4mm and also feature the compound curve which adds dramatically to the overall strength. The welding and manufactured quality is world class. 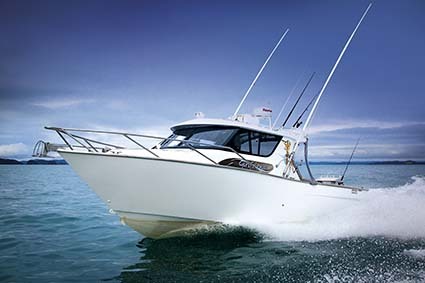 The hardtop, cabin enclosure, companionways, bow and anchoring setup are all just right and the curvaceous hardtop carries a masthead, liferaft, rocket launcher, remote spotlight, Raymarine radar aerial, communications aerials and well-defined handrails. I would love to have her as a charter vessel, although I have to admit a personal leaning for a single shaftdrive configuration with thrusters to help manoeuvrability in commercial operations. Girlfriend has a Volvo Penta leg, mid-mounted engine and jackshaft giving her the high manoeuvrability needed in gamefishing pursuits. The owner/operators are highly experienced fishos in their own rights and that knowledge shines through in the no-nonsense approach to the work area. 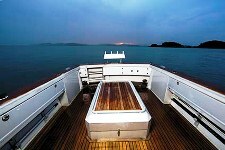 The curved transom allows full walk-up ability, free of marlin boards and any other obstructions due to a recessed leg. The duoprop drive is actually under the transom, so the chances of losing a fish as it dives under the boat is highly minimised, as is the ensuing gearbox damage from line around the prop seals. Line-cutter technology may well have improved from the horrors of the past but it is still not perfected, so the White Pointer transom layout is exceptionally well-planned. Fishing on Girlfriend provides stability comparable to standing on the end of a pier. Her 2.9m beam, 18° deadrise and strong reverse chines combine with excellent weight balance and distribution for a really comfortable experience. All of the coamings have hard-wearing teak trim at a perfect working height of 730mm deck to gunwale, with the added benefits of under-gunwale lighting and a warm bum from the teak lining when you sit along the edges in colder weather. 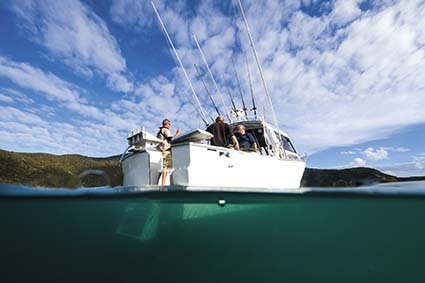 There are large livebait tanks, tuna tubes, a divedoor to starboard with an inbuilt ladder and stainless steel rodholders exactly where you look for them. Buoyancy is provided by pressure-tested compartments throughout the hull. Under the cockpit floor are storage compartments with easily accessed trapdoors and custom-made fishbins. Every White Pointer is crafted to the customer’s individuality. This one has teak floors throughout, a terrific working surface for a serious fisher. The cockpit has large, lockable scuppers and the sides are lined with enclosed compartments keeping pumping, electrical components and switch gear well out of harm’s way. Even the enginebox serves a purpose becoming the rigging and baiting centre of the huge work area, while retaining full walkaround capability for full transom access. There is plenty of interaction between those fighting the fish at the back and the helm position. 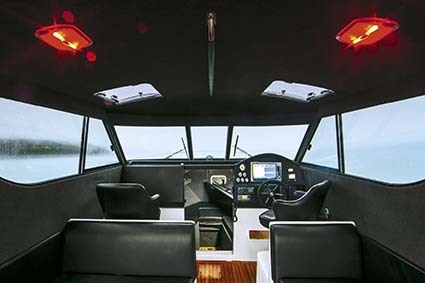 Other examples of the same hull have been optioned with fully enclosed wheelhouses incorporating external head facilities, but Girlfriend’s owners chose an open-plan layout more in tune with the fishing purpose. There are long bench seats extending from behind the helm and passenger seats enclosing cavernous storage and two Engel 60lt fridge/freezers plus a two-burner gas stove in the portside unit. These seats have padded lids which our intrepid, young photographer Jack Murphy and I can attest to as being a great spot for an afternoon ‘nanny nap’ while waiting for a marlin to strike a drifted livey. The helm is typical of most Kiwi dashboard offerings in shape, however it is leather upholstered. It is fairly large and flat with a slightly curved upper bulkhead and offers an immediate view of all instruments, including the Raymarine E140W 14in touchscreen combined sounder GPS, plotter and radar combo. There is also a Raymarine ST70 colour SmartPilot and accessories including SPX10 SmartPilot core pack, ST70 control surface mount with rudder reference. She’s got all the usual VHF and 27MHz communications, spotlight remote, trim tabs with indicators and a Fusion stereo system with iPod docking station, AM/FM tuner and four speakers. If you want to moor for the night in that protected inlet simply anchor-up with the Lewmar 1000 free-fall winch and be accommodated in a full V-berth with cushions and dual sidepocket storage. There’s an electric-flush toilet with macerating unit in the traditional position. 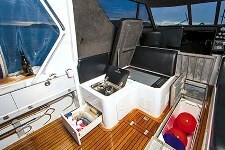 The complete package is full of quality accessories, such as a removable transom bait station, clears to enclose the wheelhouse, LED lighting throughout, a commercially rated deckwash system, engine soundproofing upgrade, twin-battery system including VSR, and a full freshwater system with 60lt tank. This big girl gets up and boogies to a wide open throttle at just over 37kts at 3500rpm where she’s sucking 77lt/h, which isn’t all that much for this bad girl at her finest. However, bring her back to a much more modest, sedate and sensible cruising range of 28.5kts at 2800rpm and you’re moving quickly for that fast run to the shelf at an economical 43lt/h. Even more sensibly, most of us prefer to travel at a moderate pace around 20kts, which she achieves at a comfortable 2200rpm and using a miserly 28lt/h. The White Pointer 940 Pro Sportsman keeps her head up proudly throughout the rev range and the smooth ride gives an almost surreal sensation of speed, enhanced by the fact that you can carry on a conversation even at top speeds due to the care taken in acoustic suppression. You can tow liveys all day with the Volvo diesel ticking away at just 600rpm and a nice slow 4.4kts. However, when all hell breaks loose and you need to make that mad dash through the washing machine, this is a boat that you can trust to be a dependable, predictable ally to get you home safe and sound with a minimum of fuss. See the full version of this review in Trade-A-Boat #453, June / July 2014. Why not subscribe today?